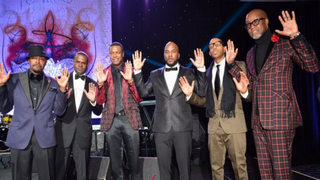 Atlanta Mayor Kasim Reed drew the ire of a local police union because a photo he took in December recently resurfaced, and it shows the mayor alongside other African-American celebrities raising his hands in the “Hands up, don’t shoot” pose—a gesture that has become associated with the protests against the police killing of 18-year-old Michael Brown in Ferguson, Mo., the Atlanta Journal-Constitution reports. The photo was taken at an Atlanta event and shows the mayor standing alongside other public figures including rappers Ludacris, Young Jeezy and actor Chris Tucker. They all held their hands up high in the “don’t shoot” gesture. Ken Allen, the president of the International Brotherhood of Police Officers Local 623, described how the mayor’s participation in the photo suggests that Atlanta’s police have a problem with race relations. Reed’s office responded to the criticism with a press statement saying that while he is supportive of all police, including Atlanta’s law-enforcement community, the photo is consistent with his views that he did not agree with the Ferguson grand jury’s decision not to indict Brown’s killer, now-former Police Officer Darren Wilson.